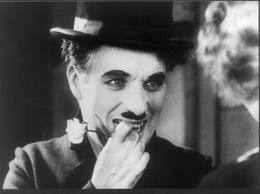 People keep telling me that Chaplin wasn’t funny. If that is so, I don’t know what the audience was laughing at when I saw this film in the cinema: I don’t think I’ve ever seen a cinema audience laugh so much. The film itself is pure alchemy. Chaplin takes a hackneyed tale, and, by some magic beyond analysis, turns it into pure gold. That ending shouldn’t work, but it does. Like Dickens (with whom he shares much in terms of moral and artistic values), Chaplin is often accused of sentimentality; but, again like Dickens, if he hadn’t risked being sentimental , he wouldn’t have been able to create scenes as ineffably beautiful and moving as the finale of City Lights. 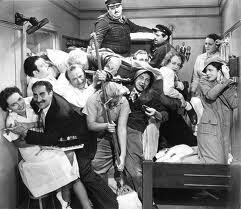 It’s hard to believe that entire generations have grown up now without having seen a single Laurel & Hardy film. There has been no end of analysis into just what it is about these characters that makeS them so funny, and so appealing, but as with all things wonderful, there are aspects that are beyond any analysis. Ollie is so very pompous and self-important, and yet we love him. Why? Who knows! Stan is completely and utterly vacant, and yet we don’t look down upon him, or regard him in a patronising manner, or feel ourselves superior in any way. Why? Again – who knows! The boys were generally at their best in the short films, but occasionally, as in Way Out West and in this, their magic remained intact for feature films also. The story is simple, but what they make out of it is, for me, a lasting joy. 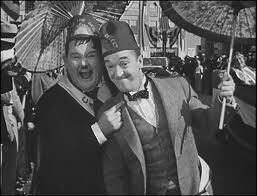 No matter how down I may happen to feel, Stan and Ollie cheer me up. I don’t think I feel such deep affection for any other fictional character, either in cinema or in any other medium. Alongside Chaplin and Stan & Ollie, the Marx Brothers form the third of that select group that, for me, defineS the gold standard in comedy. The general consensus of opinion amongst Marxists is that the boys were at their undiluted best in the Paramount films, and that after they moved to MGM, their anarchic comedy was watered down by romantic subplots, musical interludes, etc. There is certainly a great deal of truth in this, but it is also true that the first two films they made for MGM, A Night at the Opera and A Day at the Races, not only have better production values than the Paramount films, but also contain much of their finest material. Yes, the romantic and musical interludes do slow things down a bit, but speaking personally, I do find a certain period charm to them. Most importantly, they do not get in the way of the comedy. Right from the opening scene in the restaurant, to the evergreen contract-signing scene and the equally evergreen cabin scene, right up to the finale – one of the very best, involving the sabotage of Il Trovatore – just thinking back on this makes me break out into a broad grin. Sometimes, something can be very great even though everyone says so. Except, perhaps, no-one says so any more about Orson Welles’ Citizen Kane: that’s one of those pieces of received wisdom that we, eager to be thought of as independent in our thought, steer away from. 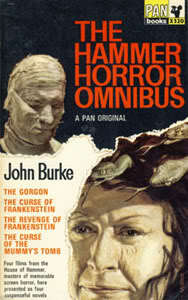 This film is sometimes criticised for being merely a bag of tricks. But the word “merely” is misapplied. It is a bag of tricks, certainly, but the tricks are almost invariably there to serve a purpose: frequently, they aid the narrative flow rather than otherwise. Take, for instance, that passage where Kane signs up all the top journalists from a rival newspaper: we close in on a group photograph, see a flash on the screen, and then, with one of the most daring cuts I have seen, we pull back out of the picture as the picture comes to life – that cut covering two whole years. Flashy? Yes. But could the story have been told more economically, and with such clarity? And it’s like this throughout – the tricks serving the narrative and the drama rather than getting in their way. And the drama is engrossing: it is about the betrayal of promise; of youthful idealism and dynamism overtaken by a profound sense of futility; and of the loneliness of old age, and a yearning for something that has been lost. 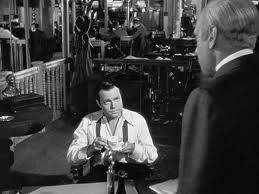 Citizen Kane has all the complexity of a great novel. I often think of Billy Wilder’s Double indemnity, The Lost Weekend and Sunset Boulevard as a sort of unofficial trilogy – three extremely dark films, each featuring at the centre a self-destructive protagonist. How did the Factory of Dreams ever produce films such as these? 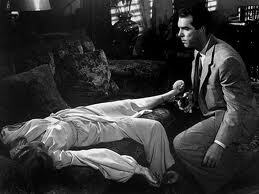 Double Indemnity, in particular, is a great favourite: it’s the archetypal film noir, and virtually defines that genre all by itself. There’s nothing I can say about this film that hasn’t been said a million times before: the script, the performances, the direction, the lighting – it is all absolute perfection, and even though I know virtually every shot and every line by heart, I still get a kick watching it, just to enter that world again. So let us just move on. Lyricism isn’t often associated with action films. And yet, John Ford, known for action films – especially Westerns – was a poet of the cinema. Only he could make a film about the gunfight at the OK Corral and call it My Darling Clementine. They Were Expendable was intended as a wartime flag-waver, and depicts thus marines in the early stages of the war against Japan. How typical of Ford that even when making a flag-waver, it is a defeat he focuses on. Among the stars of the film is John Wayne (although he essentially plays second fiddle here to Robert Montgomery). But there are no gung-ho heroics, or boys’ own adventure. Indeed, the focus isn’t even on the plotline as such: often, Ford is happy not to explain all the details of the plot. The focus is on people, all people, even those who appear fleetingly: the camera still lingers on their faces, on their expressions. When the radio announces that US are at war with Japan, Ford’s camera focuses not on the men, but on the faces of the female Japanese singers at the bar. 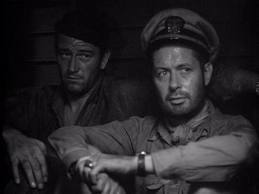 Later, a young marine is shivering with fear, and when asked by his officer if he is cold, lets slip out that he is afraid: the commanding officer, Robert Montgomery, pauses for a while and tells the lad that he has no monopoly on fear before moving on. The boy never re-appears, but once again, the camera focuses on his face, and lingers. What Ford depicts is heroism – not the sort of macho heroism we tend to associate with John Wayne films, but the everyday heroism of ordinary everyday people, people who know that they are expendable and who yet sacrifice themselves in the name of duty, of service. Time after time the camera captures haunting images that only a true poet can conjure up – an old man refuses to leave his house in the face of invasion, and sits quietly on his own on his front steps; a troop of ragged soldiers march into no destination in particular amidst the swirling dust. And, as surely as Renoir did in La Grande Illusion (which I may well have picked in my Top Ten on another day), Ford depicts the essential nobility and dignity of the human race, even in the face of the unthinkable. It is easy to be cynical of such a vision, but it is a vision we need to hold on to. This is a heroic, tragic tale of epic dimensions – perhaps the closest cinema has come to the Homeric. 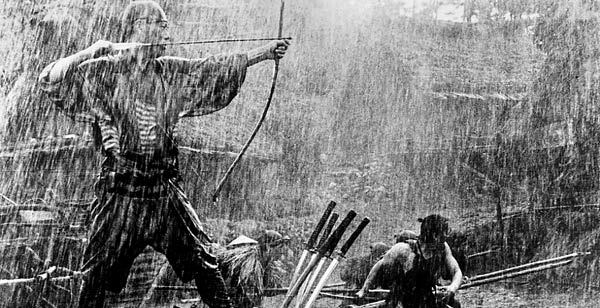 The individual actions scenes, especially that final battle in the rain and the mud, are rightly legendary: they have been much imitated, but never equalled. The pacing of the narrative over three and a half hours is immaculate: Kurasawa knows exactly when and how and to what extent to raise or lower the tempo. Each individual scene is engrossing, and the shape of the broad narrative arc is nothing short of breathtaking. Three films, I know, but should be counted as one. 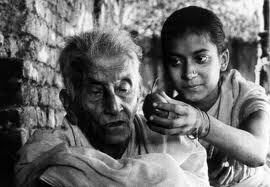 This trilogy, directed by Satyajit Ray, are works of profound humanity, and I never fail to find them moving. I’ve written about these films quite recently on this blog, so let’s move on. 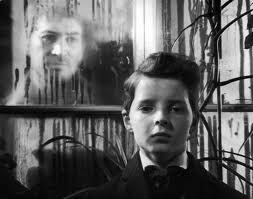 Henry James’ The Turn of the Screw can claim to be the finest example of the genre of the ghost story, and it has inspired not one, but two masterpieces – Benjamin Britten’s opera, and this film, directed by Jack Clayton. Once again, I have written about this recently on this blog, so let us move on to my final choice. Ingmar Bergman had already announced that this was to be his last film, and he was determined to go out on a high – to put into a single work the best of himself, to create, as it were, a summary of all past achievements. The result could have been a hodge-podge, but it isn’t: it is magical, right from that hushed opening as the boy Alexander plays with his toy theatre, right through to that deeply enigmatic ending some five hours or so later. (And incidentally, I would recommend anyone watching this to get hold of the full television film – this film was intended specifically for television – rather than the abridged version released for cinema). 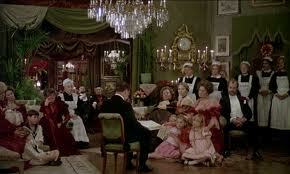 The warmth of the Christmas party scenes, the sheer terror evoked at the death of the father, the austerity and bleaknesss of the scenes at the bishop’s house, the magic and fantasy that invades the film towards the end … all the disparate elements is handled with the skill and artistry of an absolute master. A worthy finale to one of the most brilliant of cinematic careers. Back in the days when reference books had not yet been made more or less redundant by the internet, Halliwell’s Film Guide, and its companion volume, Halliwell’s Filmgoer’s Companion, were essential purchases for any self-respecting film buff. Of whom I was one. Or, at least, of whom I fancied myself one. If you wanted to know the director or cinematographer on any film, if you wanted to check who it was who composed the score for Sunset Boulevard or who wrote the script of Vertigo, Halliwell was the man to turn to. 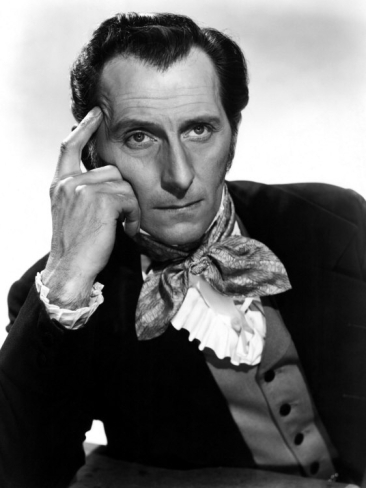 But you got more than mere facts: Halliwell provided for each film a star rating, a brief synopsis, and a few brief – but extremely characterful – critical comments. And these critical comments, I remember, I used to find infuriating. How could he give three stars to a piece of dated Hollywood moonshine like Portrait of Jennie, but give only one to a masterpiece like Through a Glass Darkly? Why does no film made in the last 20 years or so get the maximum four-star rating? Why can he not appreciate the miracle that is Pather Panchali? Why is a film of the stature of Tokyo Story not even listed? “Eccentric” seemed too mild a word under the circumstances. Since his untimely death in 1989, Halliwell’s Film Guide, though still in existence, has been thoroughly revised by other hands. And the result, accurate and reliable as before, is also, no doubt, more reliable in its critical judgement, and covers some very important aspects of cinema that Halliwell had ignored simply because he didn’t care much for them. So far, so good. However, these later editions are also bland. True, Halliwell’s critical judgement, even then, was frequently infuriating, but what did shine through was a certain personality. The judgements, whether you agreed with them or not, were the judgement of someone who was happy to declare his personal tastes loud and clear, and who wasn’t prepared to bow merely to critical consensus. The latest version I flicked through read as if it were written by a committee. (Indeed, it probably was.) Although much has no doubt been gained, something rather precious, it seems to me, has been lost. I am fortunate to have still a copy of the 7th edition of Halliwell’s Film Guide – the last that Leslie Halliwell had prepared before his death. These days, I find myself quite enchanted by it. I find myself delighted even by the things that used to infuriate me so all those years ago. I see once again the mere two stars awarded to Pather Panchali, and, this time, find myself thinking that two stars isn’t really too bad a rating given this isn’t his kind of film. I see the omission of Tokyo Story, and I chuckle to myself, thinking “Well, that’s Leslie Halliwell for you!” All shortcomings of critical judgement are excused as one would excuse the eccentricities of a favourite uncle. And above all, I find myself enjoying Halliwell’s quirky personality: here is a man who clearly has a deep affection for films, and when he writes about what he loves, the sense of delight he communicates is so infectious that I find it hard not to take delight in his delight. Halliwell loved old Hollywood. He loved the artifice of these films, the glossy production values, the moonshine, the splendid black and white romanticism. I remember him saying once that the real Paris was never as romantic as the Paris of the MGM sets, and every time I visit the city, I can’t help thinking how right he was. He loved the kind of film that I, as a keen watcher of films on television some thirty or forty years ago, grew up with – the classic Hollywood films of the 1930s and 1940s. And 1950s as well, although, no doubt, Halliwell would have felt that the rot was beginning to set in even then. However, the past, as they say, is a foreign country, and, though now only in my early 50s (which I am assured isn’t too old really), I frequently find myself alarmed by how deeply even the recent past appears to be buried. I have, I suppose, long since given up being shocked that children nowadays grow up without ever having watched a Laurel and Hardy film; that people who would consider themselves as “being into movies” have quite frequently not even heard of, let alone seen, The Maltese Falcon or Casablanca or Double Indemnity; that most people would not be able even to name a single one of Jimmy Cagney’s gangster films – or, indeed, even know who Jimmy Cagney was. Well, I suppose these films that I love so much have all had their day. Nonetheless, these are my films: these are the films that I grew up with. Not only do I not see anything reprehensible about looking back in affection, keeping in touch with one’s past seems to me a positive benefit: contrary to received wisdom that tells us it is wrong “to live in the past” – whatever that is supposed to mean – honouring the past and respecting the present seem to me mutually enhancing rather than mutually exclusive. Outstanding showbiz biopic, with unassuming but effective production, deft patriotic backdrops and a marvellous, strutting, magnetic star performance. A superb film that could scarcely be improved upon … Acting, photography, direction combine to make this an unforgettable experience, a poem of a film. As for the more recent films that I in my late teens and early twenties thought were masterpieces, Halliwell’s judgement often seems to prove more astute than it had seemed at the time. After all, nothing dates quite so quickly and quite so badly as cutting edge relevance. An egotistic Southern girl survives the Civil War but finally loses the only man she cares for. Now, what more can there be to say about this film? I am pleased to see there’s a site devoted to Leslie Halliwell. Warmly recommended – especially to anyone who has an affection for old Hollywood films.